Cancellation of participation is possible till 31 March, you get 75% money back. From April 1 no refund is possible. We have already committed ourselves to several other partners in binding contracts. There is a Whatsapp group for the conference. Please follow this link to be included: https://chat.whatsapp.com/HVmIRQWgrio4ERetpQv4DL. We need some social media agents who can tweet, Facebook and use Insta about the conference. Contact us (eac11@exarc.net) if you volunteer. We also have photos et cetera of most presentations which we share with our social media people. Please bring information material of your museum, your relevant activities (flyers, booklets, ...). Also, don’t forget to take the remaining material back home again. A weather forecast for Trento (in English): https://www.yr.no/place/Italy/Trentino_and_South-Tirol/Trento/. The kitchen closes at 22:00h. During the full conference, delegates receive a 10% discount at Forst and at Rosa d’Oro, Piazza Santa Maria Maggiore, 21 (https://www.ristoranterosadoro.com) and 5% discount at Birreria Pedavena, Piazza di Fiera, 13 (http://labirreriapedavena.it) when you show your badge. This you can pick up at the registration table at the conference. To get discount on Wednesday evening, you have to show the email you received. Participants to the conference have free entrance to the MUSE Museum in Trento when showing their conference badge any day from 2 to 4 May, https://www.muse.it. Registration opens at 7:30h on Thursday. We start at 8:30h with the first presentation. The conference venue is at the Humanities Department of the University of Trento, Via Tommaso Gar 14. You MUST have paid in order to participate. There is a guest Wifi at the Faculty. Codes will be shared on site. Alternatively, please use your eduroam login. You can take pictures of the presentations and place these on social media or keep them for yourself as long the presenter doesn’t say he/she does not want that. Please consider this as a fair use policy and don’t take pictures of each slide. The conference is a public event. Pictures will be taken both by participants and by organisers, for social media, personal use and for PR of the conference now and in the future. Please be aware that you may appear on some of the pictures. Thursday night dinner is at Birreria Pedavena, Piazza di Fiera, 13 (http://labirreriapedavena.it) for those who registered and paid for it. If you did not book a dinner, you can go to Forst and Rosa d’Oro (10% discount for delegates during the days of conference). Friday night diner is at own expense. You need to reserve in advance. For those going on Excursion 1 and 2, please meet at Torre Vanga and be in time! This is very close to the train station.The buses leave at 8:00h sharp. If you booked and decided not to go, let us know as soon as possible. We still have places available for the excursion to Fiavè & Parco Archeologico del Bostel di Rotzo for 55 EUR, please check https://exarc.net/meetings/eac11/excursions. Email us at r.p.paardekooper@exarc.net if you are interested. For Excursion 3, meet at 14:00h at the Museo S.A.S. Spazio Archeologico Sotterraneo: Piazza Cesare Battisti. Of all three excursions, everybody is back in Trento at 19:00h. For Saturday night dinner, you can choose between the place we suggested for previous days, but please book in advance. Many things can be solved by using the WhatsApp group or by contacting your colleagues during the conference. If you need the organisers and you cannot reach us in person, please use our mobile phone number: (+31) 640.263.273. Those who need a certificate of attendance can request such by email after the conference. 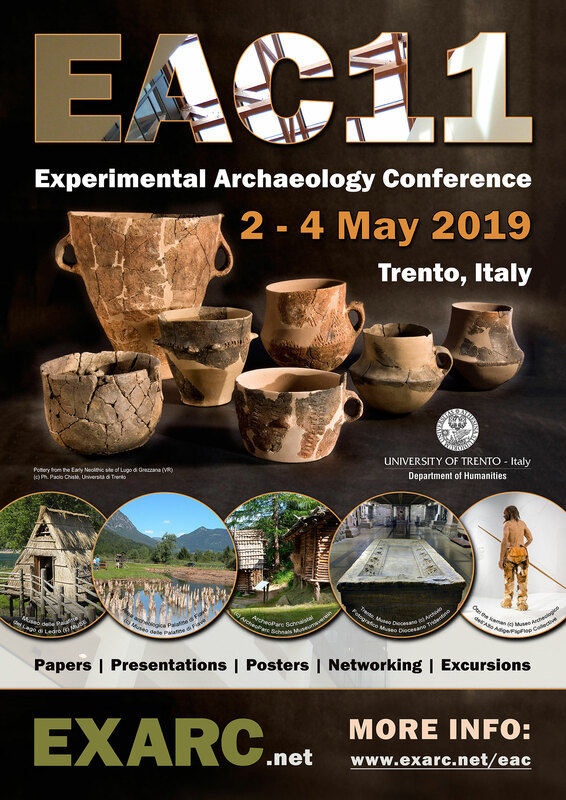 Please direct your query to: eac11@exarc.net and let us know before May 15.